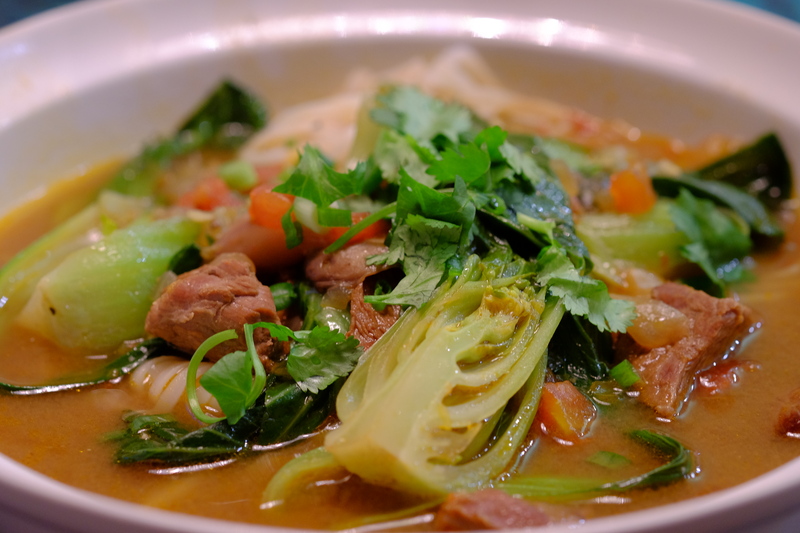 Spicy Beef Noodle Soup | What's for Dinner? Posted on February 3, 2019 by What's For Dinner? My family LOVES trying different ethnic dishes! Our travels are always tailored around food, and we’re especially drawn to all the different Asian cuisines. Thai, Indian and Nepalese are among our favorites, as we just love the combination of all the different spices used to create these dishes. I’m always so excited to get back home and try recreating the amazing food we’ve found on our trips! This particular soup has so many of the flavors we love in a dish (garlic, ginger, miso, chilies), so when I read over the list of ingredients, I knew we were going to love it! I was RIGHT! The soup is SO full of flavor with just the right amount of heat. With plunging temperatures all around the country right now, this soup will definitely warm you up! Heat 1 teaspoon oil in Dutch oven over medium-high heat. Brown half of meat on all sides being careful not to overcrowd. Transfer cooked beef to a plate and repeat procedure with 1 teaspoon oil and remaining beef. Heat remaining 4 teaspoons oil over medium high and add onion, garlic and ginger. Cook, stirring often until onion is almost tender, about 6 minutes. Stir in tomatoes, samba oelek, miso, coriander and pepper. Cook, stirring constantly, 1 minute. Add stock, soy sauce, brown sugar, and browned beef. Bring to boil; partially cover and reduce heat to medium-low to maintain a simmer. Cook until beef is almost tender, about 45 minutes. Add mushrooms; cover and cook until beef is tender, about 30 minutes. Cook noodles according to package directions; drain and rinse with cold water. Drain well. Add bok choy to soup; cover and cook until crisp-tender, about 4 minutes. Arrange about ½ cup noodles and 2 bok choy quarters in each bowl. Ladle about 1 ½ cups soup into each bowl, and sprinkle each serving with 1 tablespoon green onions. Top with cilantro sprigs. Sambal Oelek is a ground fresh chile paste that has a good amount of spicy heat. This recipe calls for ¼ cup (4 T), which, for my family, is perfect because we love spice, but depending on your preference/tolerance for heat, make adjustments to the amount you use. I wouldn’t suggest leaving it out as I strongly feel it is a vital component of the flavor profile of this soup, but you could certainly reduce the amount you use without losing the flavor it lends to the soup. I’d suggest cutting it in half to 2T the first time, and see how you like it.